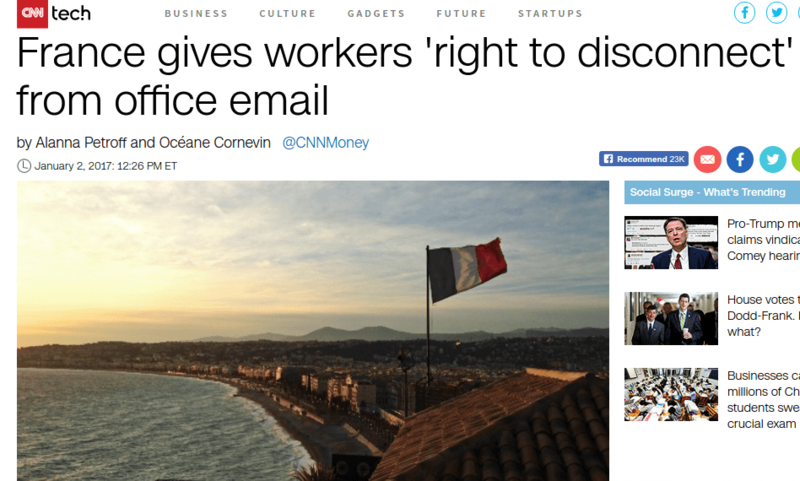 When the rumour of a new French law to grant employees the right to be disconnected from the obligation to answer work emails after office hours hit the English press in 2014, there were lots of reactive comments. What really happened in 2014 was not a new law being passed, but in fact a collective agreement for certain categories of French workers whose worked was counted in days rather the 35-hours working week. So everyone thought that the English press overreacted to the rumour, and the Economist’s Paris correspondent took pain to explain this. And the British media had eggs on their faces! So it seemed! The right to disconnect is real from 2017! Fast forward just about three years on, in January 2017, France really DID make this “right to disconnect” into a law! Perhaps this could be tied to the phenomenal growth of the use of smartphones everywhere in the world during the past three, four years. Smartphones ownership in France was already at 64.1% in Quarter 1 of 2014, by the same quarter in 2017, this has risen to 71.1%. For the USA, smartphone ownership in January 2017 is around 77%. In Malaysia, smartphone ownership has already reached 65% as reported in February 2016 and is set to reach 17.8 millions people in 2017. Can Malaysia adopt the “right to disconnect”? With almost every working adult in Malaysia now owning a smartphone, it is not surprising that work has been creeping into the “smartphone” during family / leisure time after work. So if you see an adult of working age, keeps his/her head down while having a shopping mall outing with his/her family on a Sunday, it is not surprising that it could be work-related. The boss’s expectation aside, it is often the smartphone user’s inability to disconnect his/her mind that prompts him/her to use the smartphone to check work-related stuff, even on a rest day. Asian bosses are notorious for being the “slave drivers”, the bulk of Malaysian bosses are no exception. By bosses, I don’t mean just those tycoons but immediate superiors, managers and even supervisors of the working masses today. In my experience, the expectation of bosses is simple, staff are expected to reply to emails or SMS or Whatsapp messages even long after the work hour is over. The days before the smartphones was better for staffers, at least you only have SMS messages to worry about, there is no spreadsheets to open, photographs to download, Facebook post to check etc. In fact not all tycoons have this “no right to disconnect” mentality. My former boss who belongs to the “tycoon class” is one fine exception who practiced, to a great extent, this “right to disconnect”. During my stint as Tan Sri Clement Hii’s special assistant, it was between 2012 – 2014, before smartphones are so ubiquitous as today. So Whatsapp and other instant messaging platforms were not common. I was only given one special requirement from him, when I was off duty I was to keep the mobile phone switched on at all times. My boss just wanted to send out SMS messages to his team as and when he had ideas and instructions for us, regardless of the time of day. The reason for him to have his team keeping their mobile phones switched on has got to do with the “double ticks” that we now see on Whatsapp. All he wanted, was to be sure that his instruction was delivered via SMS, he did not need to see the “double blue ticks”, i.e. ; if the message was delivered, it would be fine, he did not need to see if the recipient had read it. Once delivered however, the problem, task, or instruction was now became the accountability of the recipient! We were specifically told by him that we would not be required to respond to his SMS unless the matter was urgent, for which he would call the staff concerned instead of sending an SMS. To his credits, Tan Sri Clement only called me a few times during my stint with him and on all occasions it was really something urgent that needed to be taken care of immediately. Here is a very smart man who knows how to maximize his brain power by clearing from his mind the least important stuff: remembering a “to do list”, about tasks, problems etc. which he could delegate to his team. By offloading these, as soon as possible, his mind power could be deployed on more productive tasks, such as strategising on new projects, thinking through new ideas or just simply to relax, to recharge. By not requiring his staff to respond immediately, he observes the staff’s “right to disconnect”. Of course, all bets are off when there is an emergency or something really urgent, such as guarding the company’s reputation on social media which is something that needs to be taken care of immediately. I wonder how many “tycoon class” bosses are as understanding and wise as my former boss! By minimizing the intrusion into his staff’s leisure time, Tan Sri Clement stands to gain more by having his team members better recharged and refreshed to ‘fight another day”! Even if Malaysians working adults are given the “right to disconnect” as did their French counterparts, I wonder how many of us will judiciously exercise this right? Exactly how many of us can disconnect our mind fully from work after we have clocked off? I think both question are subject to further debate!